Happy Wednesday! You know what that means....another Victorine Originals creation! This card was made for my nephew who received his First Holy Communion this past Sunday. Do you know how hard it is to find stamps that fit that occasion?? Victorine Originals to the rescue! 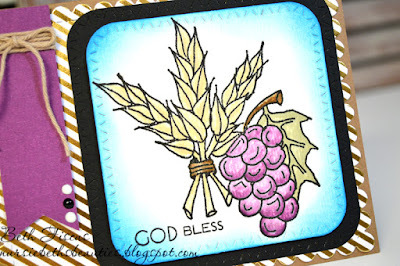 The grapes and wheat (Communion) stamp was stamped on watercolor paper using Versafine Onyx Black ink and my Hampton Art Stamp Perfect. 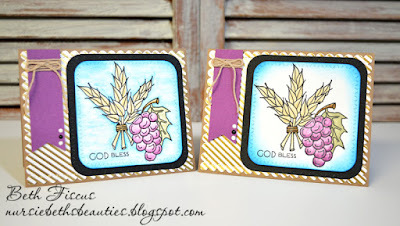 I then cut it out with a GMD slash stitched round square die and watercolored it with Tim Holtz Distress Inks. The colors I used were Antique Linen (wheat), Seedless Preserves (grapes), Vintage Photo (wheat tie and grape stem), Old Paper (leaf), and then I blended Salty Ocean around the outside of the die cut. The background was DCWV 6x6 Gold Foil paper cut with GMD scalloped stitched rectangle die and the banner was from DCWV's 6x6 Brights cardstock stack. I used Totally Kraft Trendy Twine and Nuvo Crystal Drops in black and white for embellishments. The rest of the story is that I made a different version of this stamped panel in which I used the blue distress ink to watercolor in the entire background. I thought I liked the one on the right better, so that is the one I gave to my nephew. What is your opinion? Do you prefer the one on the right or the left? Here is a close up of the Communion stamp that I used. Very pretty cards! 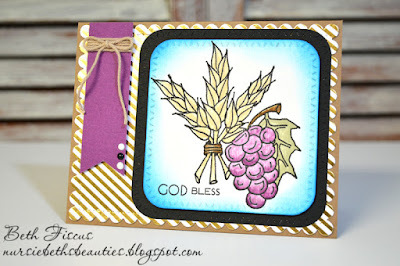 I love how you used the watercolors on your card! 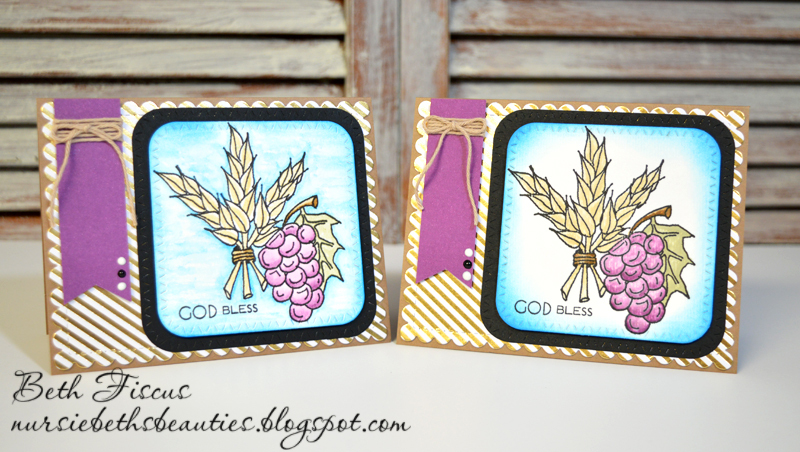 The foil paper brings such elegance to your card and I just love those dies! Such a lovely card my friend. Awesome coloring! Beautiful first communion card Beth I love the colors and perfect design. Have a blessed evening my friend. Beautiful cards Beth.. your coloring is wonderful! Have a great day!